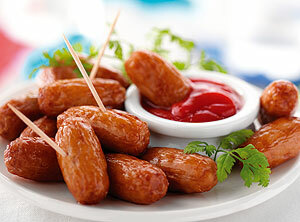 Cooked sausages from the Big Kitchen are available in a variety of formats, sizes and flavoured recipes. All of our sausages are carefully prepared using only the highest quality cuts of meat, and our own blend of herbs & spices. Fully cooked they offer consistency of quality, effective portion control, good yield management and are ready in minutes, making them perfect for buffets and dining menus. Choose from our market leading range of pork, regional and specialty recipes.